A: Yes. Every grooming is done by appointment only to ensure your dog receives our full attention. Q: How long does it take for my dog to get groomed? A: As a general rule, each dog takes approximately 2 hours from start to finish for most small to medium dogs. However, grooming time depends on coat condition, style of cut, and behavior of your dog. If we require more time to finish your dog, you will be notified when you first drop your dog off. Q: What is included in a Full Groom and how often should my dog receive one? A: A Full Grooming includes ear cleaning (plucking for those who requires it), nail clipping, sanitary and paw shave, a bath with our all natural shampoo and conditioner, hand drying (we do not cage dry here at Designer Dogs Grooming Studio), completely brushed, and a full body hair cut in the style you desire by our certified dog groomer. Depending on the style of hair cut and the maintenance you put into your dog, we recommend a Full Groom once every 4-12 weeks. The longer style your dog has, the more frequent you need to bring it in. Q: What is a Bath and Tidy and why should I bring my dog in for one? A: A Bath and Tidy includes ear cleaning (plucking for those who requires it), nail clipping, sanitary and paw shave, a bath with our all natural shampoo and conditioner, hand drying (we do not cage dry here at Designer Dogs Grooming Studio), completely brushed, hand scissored trimming on the face and paws. Bath and Tidy ensures your dog getting a complete brushing to stay matt free in between hair cuts. This allows your dog to always be clean, beautiful and feeling great. We highly recommend a Bath and Tidy every one to two weeks in between Full Groom so that your dog will never have to suffer the pain of matts pulling on their skin for several weeks before they get a Full Groom. This is especially important for owners who like their dogs on the fluffier and longer side. Q: My dog is matted, what should I do? A: Depending on the severity of the matting, we will recommend the best course of action. If it is minor matting and we agree to brush your dog out, you may be charged our de-matting price, which is $1 for every minute it takes to have your dog brushed out. If the matting is to sever, we will recommend a complete shave. A complete shave is the best course of action in the case of sever matting. It allows for the least trauma and pain to your dog. At Designer Dogs Grooming Studio, your dog’s well-being and comfort is the most important and will always come first. Q: Can I stay with my dog? A: No. In most cases, when you the owner is around, your dog will be trying to get to you. This creates extreme danger for both your dog and the groomer as grooming involves sharp objects. The last thing our groomer wants is to injure your precious dog. Typically dogs settle down once their owners have left the shop, allowing a safer and less stressful grooming session. Q: What should I do before bringing my dog in for a groom? A: As your dogs will be with us for 2hours or more, we highly recommend you take them for a walk so they can relieve themselves. It is also best not to feed them a big meal right before coming as stress may cause upset tummy and result in vomiting or diarrhea. We provide several different types of treats here but you can always bring your dog’s favorite treats. A: We are cash only at the moment. Debit and Credit card option coming soon. Q: Where will my dog be while waiting for pickup? A: Your dogs will not be crated here at Designer Dogs Grooming Studio. Your dogs will wait in the large enclosed area with beds, water, toys and treats provided while they wait for you. If your dog is not good with other dogs or is afraid of certain types of dogs, please inform us so we can keep your dog safe. We also require pick up within 15 minutes of given time. If you can not pick your dog up at the given time, please inform us so we can plan accordingly. Q: I just got a new puppy. When should I start bringing my puppy in for grooming? A: At Designer Dogs Grooming Studio, we do not recommend you bring your puppy in for a grooming until they have had their second sets of shots, which is usually done by the time they are 12 weeks old. Once your puppy has had their second set of shots, we highly recommend you bring your puppy in as soon as possible to get them used to being in the shop and getting groomed. After all, your puppy will be needing regular grooming through out its life. If the puppy is brought in early enough and needing only minimal grooming, it makes the grooming experience short and pleasant. 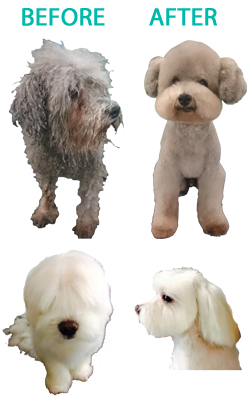 If you wait too long, and now your puppy is 9 months and getting its first grooming ever, which usually results in a short shave as it is now matted. It makes for a long and unpleasant experience for your puppy.